Second verse same as the first. 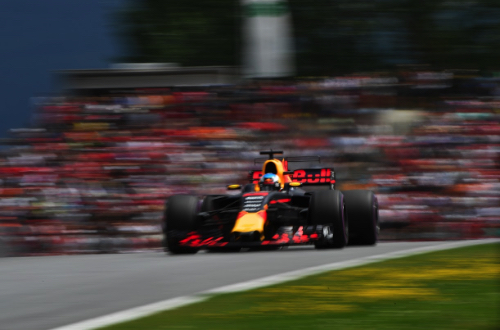 That was the case in Friday's practice sessions for the Hungarian Grand Prix with Daniel Ricciardo fastest in FP1 and FP2 in his Red Bull. And, as in FP1, FP2 was twice red flagged because of accidents. The lineup for the weekend was: Mercedes - Lewis Hamilton and Valtteri Bottas; Red Bull TAG Heuer - Daniel Ricciardo and Max Verstappen; Ferrari - Sebastian Vettel and Kimi Raikkonen; Force India Mercedes - Sergio Perez and Esteban Ocon; Williams Mercedes - Felipe Massa and Lance Stroll; McLaren Honda - Fernando Alonso and Stoffel Vandoorne; Renault - Nico Hulkenberg and Jolyon Palmer; Toro Rosso Renault - Daniil Kvyat and Carlos Sainz; Haas Ferrari - Romain Grosjean and Kevin Magnussen; Sauber Ferrari - Marcus Ericsson and Pascal Wehrlein. The ambient temperature at the start of the 90-minute FP2 session was 77 degrees Fahrenheit (25 degrees Centigrade) and the track temperature was 91 degrees Fahrenheit (33 degrees Centigrade). Poor Magnussen had to watch the action from pit wall as his car was still being repaired after Antonio Giovinazzi crashed it in FP1. The soft compound Pirelli was the popular tire choice early in the session, as it would play a key role in the race strategy, and Bottas was on the softs when he set a 1:19.591 which topped the times. Hamilton beat that with a 1:19.373. Verstappen was second followed by Bottas, Ricciardo and Vettel. Everybody was running the softs at this stage as Hamilton got down to a 1:18.779 on his eighth lap. Twenty minutes into FP2, with the initial runs on softs completed, the order was: Hamilton, Ricciardo, Verstappen, Bottas, Vettel, Raikkonen, Alonso and Sainz. One third of the way into the session, Raikkonen tried the softs and posted a 1:18.980, which put him second. Now others headed out on the soft Pirellis, and Vettel went to the front with a 1:18.638, which was just 0.018 of a second quicker than Bottas. Things went wrong for Raikkonen who coasted to a halt saying he had no power. But then the power returned and he drove to the pits. Forty minutes into the session, Ricciardo used the supers to take over first with a 1:18.455, while Massa spun on his set. The order was now Ricciardo, Vettel, Bottas and Raikkonen, who had been on the super softs, and Hamilton and Verstappen, who had been on the soft compound. The session was red flagged with 39 minutes remaining when Wehrlein had a big accident at Turn 11. He radioed that he was okay and climbed from the car. At this time the top six remained the same, followed by Hulkenberg, Alonso, Sainz and Vandoorne. Magnussen had yet to do a lap. All had done their times on the super softs bar Hamilton. After 12 minutes needed to remove the car and repair the barriers, the session was restarted. Most of the drivers headed out to do long runs. Magnussen finally got on track. Palmer spun off and hit the barriers at Turn 14, and the red flags came out again with 18 minutes remaining. There were 12 minutes left when FP2 was restarted. The top 10 remained the same as the second verse of practice wound down: Ricciardo, Vettel, Bottas, Raikkonen, Hamilton, Verstappen, Hulkenberg, Alonso, Sainz and Vandoorne.